A ll foreigners visiting, staying or developing activities in Mexico are subject to Mexican immigration law and regulations. Failure to comply with immigration provisions may be punishable by fine, prison and/or expulsion. Acts (such as signing contracts, bids, permits or other public and private documents) performed in Mexico by foreigners not holding the proper visa may be rendered invalid (voidable). Mexican immigration law is codified in the General Law on Population and its Regulations (the “Law”). Under the Law, each immigration status mandates specific legal obligations and the maximum time the foreigner may stay in Mexico under that status. All immigration categories are classified either as “nonimmigrant” or “immigrant”. U.S. business travelers to Mexico should enter the country on an “FMN”—a thirty-day business visa that the visitor fills out on the plane. Foreigners who travel to Mexico on business on a regular basis, or occupy positions in Mexican companies should obtain an “FM3” visa. Permanent residence rights under an “FM2” visa are available to foreigners who have lived at least five years in the country and fulfill the legal requirements. Nonimmigrant status is available for foreigners planning to stay in Mexico temporarily. Certain activities (i.e., residing in Mexico and working for a Mexican company) are permitted for nonimmigrants as long as authorization is granted in advance by the competent Mexican authority. Nonimmigrant status is divided into several categories. In addition to the general overall rules, special provisions apply to each category. The duration of the nonimmigrant visa, ranging from 30 days to one year (and renewable), depends on the activity to be realized. Tourist (FMT) and temporary business visa (FMN). The same form is used for both visas, which is presented upon entry. The tourist fills out one part of the form and the NAFTA business visitor another. 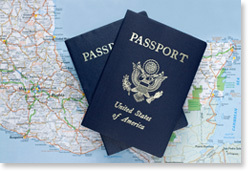 The visa is granted virtually automatically upon presenting a U.S. passport. The tourist visa is restricted to recreational or health activities and the maximum stay is six months. The temporary business visa is usually granted for 30 days. There are no restrictions on the number of times a person can enter the country with these visas. The FMN is appropriate for U.S. businesspeople who come to Mexico for short, sporadic business trips. Visitor (FM3). Various activities can be carried out under this category. An FM3 is suitable for businesspeople, investors, renters of real property, as well as shareholders, managers, officers and board directors of Mexican companies who visit the country regularly or exercise powers of attorney on behalf of a company. An FM3 is valid for one year, and may be renewed up to four times. If the visitor is representing a U.S. company directly, the FM3 may be processed at any Mexican consulate in the United States. If the visitor, however, will be representing a Mexican subsidiary, branch or other Mexican entity, or will be residing in Mexico, the visa must be processed at the immigration office corresponding to the visitor’s Mexican address or place of business in Mexico. Immigrant status can be requested by foreigners who legally enter Mexico with the intention of remaining on a permanent basis. The Law establishes a limited set of activities that may be authorized for immigrants. Immigrant status includes “inmigrantes” (residents) and “inmigrados” (permanent residents). Immigrants are provided with an FM2 visa. Residents are allowed to stay in Mexico under an FM2 for up to five years, and may request permanent residence status after that period of time. Bondholders. Suitable for persons living off their investments in Mexico or any permanent income from a foreign country. Professionals. Required for practicing a profession within Mexican territory. Positions of Trust (executives). For persons occupying director or managerial positions in companies established in Mexico. Permanent residents, on the other hand, may conduct any lawful activity in Mexico and unlike visitors and residents, do not need specific authorization for each activity. Question: may I employ foreigners in Mexico? Answer: Yes, you may. Pursuant to the Law, it is possible to hire foreigners in Mexico, provided they obtain the corresponding visa (usually an FM3) authorizing them to perform the given activity for which they were hired (e.g., to be a manager of your Mexican subsidiary). Employers are obligated to verify that the foreigner is authorized to perform the specific tasks for which he was hired and to notify the authority of any circumstance that may alter the employee’s immigration situation. As a general rule, no more than 10% of your employees may be foreigners. Question: can I travel freely to and from Mexican territory under an FM3 or FM2 without losing my immigration status? Answer: Yes, you can. FM3s and FM2s allow you to leave and return to Mexican territory without losing your immigration status. However, if your FM3/FM2 is being renewed or modified when you plan to travel outside of Mexico, you must first obtain permission to leave and return to the country. Also, immigrants interested in obtaining permanent residence status must be careful not to remain outside of Mexico for more than 18 months (whether continuously or not) during the five-year term. Question: what do I need to do if I change jobs or activities in Mexico? Answer: Except for permanent residents, your FM3 or FM2 allows you to work only for specified entities and to perform specified activities. If your employer or employment activity changes, you must modify your visa accordingly. For example, if your FM3 allows you to act as the General Manger for John Doe de Mexico, S.A. but then Jane Doe de Mexico, S.A. hires you as a Director and makes you a shareholder, you must request a change of activity and change of employer. Once the authorization is granted, the change is noted in your FM3. Question: what are the main differences between a nonimmigrant visitor (FM3), a resident, a permanent resident, and a naturalized citizen? Answer: Residency (inmigrante) and nonimmigrant visitor visas are similar in that the visa must specify each activity that the foreigner will perform and the corresponding employer/client. Both visas allow the foreigner to reside in Mexico for a one-year period, which may be renewed up to four times. Both also allow the holder to go in and out of Mexico freely, provided that the indicated form is filled out at the port of departure/entry. However, residents can obtain permanent residence status (inmigrado) after residing in Mexico for five years while nonimmigrant visitors cannot. Also, residents are given FM2s while nonimmigrant visitors are given FM3s. Permanent residents (inmigrados), on the other hand, can perform any lawful activity in Mexico without specific authorization. They can travel freely in and out of Mexico, and their visa need not be renewed. The main difference between permanent residents and citizens is that permanent residents are not allowed to vote. Moreover, under the Mexican constitution, the government reserves the right to deport any foreigner—whether a permanent resident or otherwise—without cause, while a naturalized citizen enjoys the same rights (with limited exceptions with respect to holding public office) as a Mexican-born citizen. Question: what kind of visa do I need if I am going to Mexico for a brief business trip? Answer: You need an FMN (Forma Migratoria Negocios). This visa is essentially the same as a tourist visa, and is filled out on the plane or at the port of entry. Business travelers complete the section for“Business Visitors Only”, by indicating the activity they will be performing while in Mexico. These visas are usually granted for up to 30 days only. If you plan on executing contracts or performing any other official act (e.g., signing documents before a Mexican notary or government office), then it is very important that you complete this section of the form. DISCLAIMER: THIS DOCUMENT IS FOR INFORMATIONAL PURPOSES ONLY. READERS ARE ADVISED TO RETAIN QUALIFIED LEGAL COUNSEL BEFORE DOING BUSINESS IN MEXICO. NOWHERE IN THIS DOCUMENT IS THE AUTHOR PROVIDING LEGAL ADVICE TO THE READER NOR SHALL THE CONTENTS OF THIS DOCUMENT BE INTERPRETED IN ANY WAY TO ESTABLISH AN ATTORNEY-CLIENT RELATIONSHIP BETWEEN THE AUTHOR AND THE READER. ALTHOUGH THE INFORMATION PROVIDED HEREIN IS BELIEVED TO BE ACCURATE AS OF THE DATE PREPARED, THE AUTHOR MAKES NO SUCH REPRESENTATION. Copyright © 2006-2012 Rosen Law, S.C. All rights reserved. Copyright © 2017 Rosen Law, S.C. All rights reserved.